Modeco Inc. with its complete history in working with Sheeters, offers our professional services to analyze your sheeter requirements. 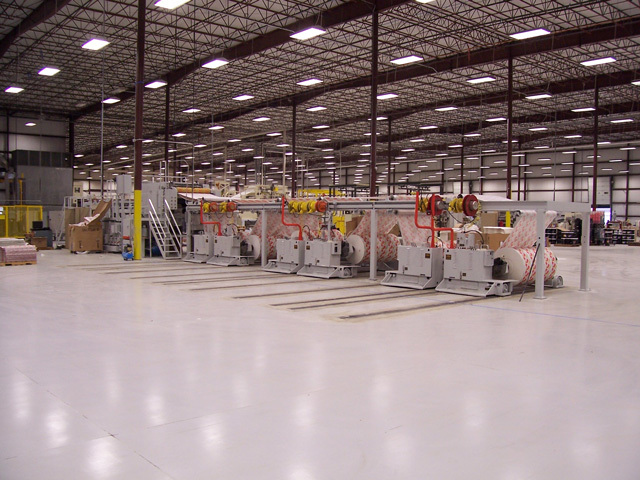 The experience we have gained since 1987 with the sheet finishing industry is invaluable when looking for a sheeter to meet your needs or to analyze the potential for your existing equipment. We can help you to bring your equipment into conformity with current safety and OSHA standards. Modeco Inc. can improve the cut accuracy, slit quality, and stack quality of your existing sheeter. Double-fly knife retrofit assemblies along with new Shaftless Rollstand installations bring your sheeter up to todays standards. Preprinted web stock can be tracked for cut-to-cut sheeting on one or multiple webs. Our electronic servo control registration systems have been retrofitted to many style sheeters converting waxed paper for the food industry, watermarked paper, and holographic material. We offer WaterJet machining services now in addition to our Sheeter services. Water jet technology involving forcing water, at very high pressure, through materials such as steel, ceramic, glass or even stone. For more information regarding our waterjet services or to learn more about this technology, click here. 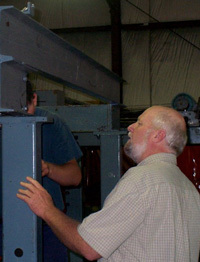 Stephen Gabel, the founder and technical director of Modeco, Inc. has been a design engineer of sheeter equipment since 1977. He has given presentations at numerous TAPPI Converting Conferences and his work has been published in the Annual TAPPI Finishing & Converting Conference Manual along with a cover piece on precision sheet finishing in the TAPPI National Newsletter. Steve founded Modeco, Inc in 1987 and he's achieved a proven track record in re-designing sheeters to improve quality and increase productivity. Modeco specializes in retrofit packages designed to improve an existing cutter's sheet length accuracy and efficiency. Modeco can also retrofit print to print registration systems for single or multiple webs,shaftless rollstands, decurlers(for board or paper), overlap systems, reject gates, web tension systems and all areas of your sheeter. With our water jet powered machine, we can cut mild steel to stainless steel, inconel, hastalloy, brass, copper, aluminium, rubber, plastic, glass, ceramic tile and stone. The table cutting area is 6' x 12' so anything smaller than that will fit nicely. This is a 5 servo machine which means complex cutting angles and compound arcs are a breeze. This method of machining can produce parts with as small as .005" tolerance and leaves a clean edge, many times eliminating the need for secondary finishing. This machine is very good for prototypes and production runs, we can work from your blueprint or your vectorized computer file. No matter what the shape, we can cut it. For more info or to discuss pricing, please contact us today. "Sheeting" is generaly the dealing with or handling of sheets of material, i.e. paper, plastic, fabric, or other synthetic materials in a production environment where proper control and efficient processing is necessary. At Modeco, we offer web conditioning systems, sheeter accessories, sheeter cutoff systems as well as supporting services such as sheeter installation and rigging, delivery systems upgrades, registration control and registration control and consulting.